Flip & Riff Keytar Musical Toy is rated 4.5 out of 5 by 11. Two ways to rock on! Dimension (in) 1.8" x 9.5" x 6.7"
Rated 4 out of 5 by AnneS from Very Engaging Musical Toy! There's a lot to love about the Flip & Riff Keytar toy! It's got a lot of bright colors, is very tactile and easy to hold, plus it's chock full of songs and sounds. Our 18-month-old likes to flip it open and closed, and tap her fingers on the keyboard. Best of all, she likes turning on the songs and dancing. There's no real learning curve to this "instrument," so every very young toddlers can enjoy it! Rated 4 out of 5 by queenbmarie from Cute Toy! This is a really adorable toy for the littles! Even my 5 year old and 7 year old played around with it with my little girl. It makes alot of musical noise, has nice color to it and keeps their attention. Mine was dancing away to the sounds and the beat of the music. She enjoyed it playing to her touch mostly. Rated 4 out of 5 by Naty1223 from This guitar/piano was a hit with all my kids. Especially my 4 year old. He loved the features on the keyboard because he was actually playing notes on it like a real piano. The good thing about this toy is that it’s two instruments in one because it opens up to a guitar that actually plays music and my son thinks he is a singer or a guitar player. He spends endless hours playing with this toy and when we leave the house he packs it in his backpack and takes it with him. He usually gets bored easily with new toys but so far he has been very entertained. The only con I would say is that I wish it would have a belt attached so he can keep it on him while he plays the guitar. Other than that, this has been one of his favorite toys at the moment. I highly recommend it because it is versitile and can easily be put away for minimal storage. Rated 5 out of 5 by Tink from Such a GREAT toy! As a musician I was very impressed at the advanced features this toy has. The piano keys are easily pressed and have very real-like sound. The guitar feature actually have "strings" that can be plucked. Really enjoy playing with this toy. Rated 4 out of 5 by Naty1223 from This guitar/piano was a h This guitar/piano was a hit with all my kids. Especially my 4 year old. He loved the features on the keyboard because he was actually playing notes on it like a real piano. 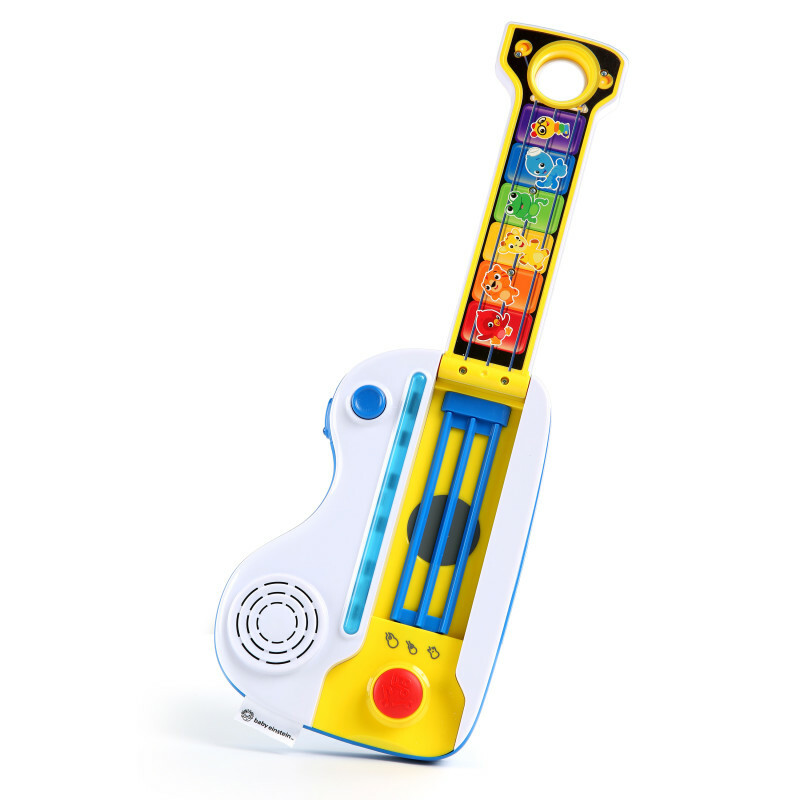 The good thing about this toy is that it's two instruments in one because it opens up to a guitar that actually plays music and my son thinks he is a singer or a guitar player. He spends endless hours playing with this toy and when we leave the house he packs it in his backpack and takes it with him. He usually gets bored easily with new toys but so far he has been very entertained. The only con I would say is that I wish it would have a belt attached so he can keep it on him while he plays the guitar. Other than that, this has been one of his favorite toys at the moment. I highly recommend it because it is versitile and can easily be put away for minimal storage. Rated 4 out of 5 by J7chick18 from Easy to use! My one year old could easily use this toy both as a guitar or as the piano! He loved listening to the different songs it can play! Rated 5 out of 5 by Violet25 from Great Feutures for baby I purchase this for 10 months nephew as a gift, he loves it one, One thing is good for this keytar music toys is baby like this age they will learn to touch and hear music and the funny to watch they are dancing too. This is 100% good and safe for baby. Rated 5 out of 5 by Tyler from Great for many ages! My 6 month old loves this as much as my 3 year old. Lots of fun and songs are not annoying to parents to hear over and over again!